Why Is My Shoulder Pain Hanging Around? Shoulder pain is one of the most common things we treat for here at PhysioSteps. Commonly, there seems to be no obvious cause of injury, and even if there is, the pain has been left to build and build until it is so bad that suddenly it is time to do something about it. So why is it that shoulder pain rarely clears up by itself and takes so long to get back to normal? 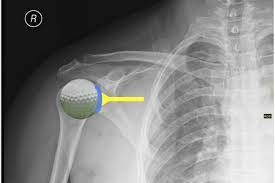 Think of the shoulder joint as a golf ball sitting on a tee….that is how stable the shoulder joint would be if there were no ligaments and muscles surrounding it to keep it under control – not very stable is it? So when there is some sort of injury to any of the muscles or ligaments that help support the joint, the shoulder then becomes painful and weak. This is because the only thing creating the stability at the joint is that muscle/ligament complex, and this has been compromised. The rest of the muscles think, ‘Oh no! This arm is so heavy and it’s so hard to hold up now!’ and they too go into a spasm to try and hold everything together and this causes you more pain (like a tug of war with your shoulder). This scenario happens whether you have injured your shoulder in an accident or if your pain has built up over months. In general, shoulder pain building up over months is due to certain muscles not working how they need to, causing other muscles to do, not only their job, but try their best to pick up the slack of these overused and weak muscles. The muscles picking up the slack are often the ones that start to degenerate, causing swelling and pain in the tendon and muscle spasm or knots in the muscle. Basically you end up with a whole shoulder complex that doesn’t do what you want it to. 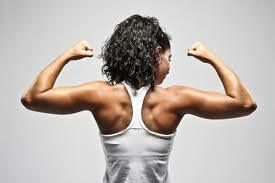 And this is the case even for those of you who are fit and active, with seemingly strong muscles! When you leave a shoulder to develop to this point, it continues to degenerate, making it at risk of tearing and harder and harder to fix, even with surgery. Change aggravating activities. There is generally something we can suggest to make what you do, be it at work or at home, easier for your shoulders and less aggravating. The best thing you can do is to get it checked out by a musculoskeletal professional, who will tell you exactly what is going wrong, why and what can be done about it. This saves you a lot of pain and worrying in the long run! At PhysioSteps we are always here to help, with the goal of getting you back to your best, as soon as we can!